Recently it has become harder to find the time to write, and as a result I have accumulated a surplus of pieces to write about. 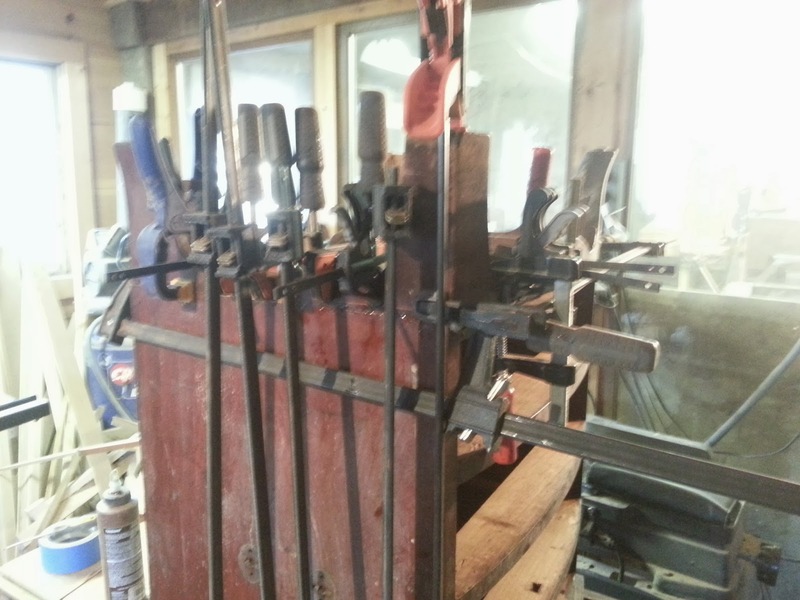 One of these pieces was a chest I worked on about a month ago. For lack of a better term, I will call it a bachelor's chest. 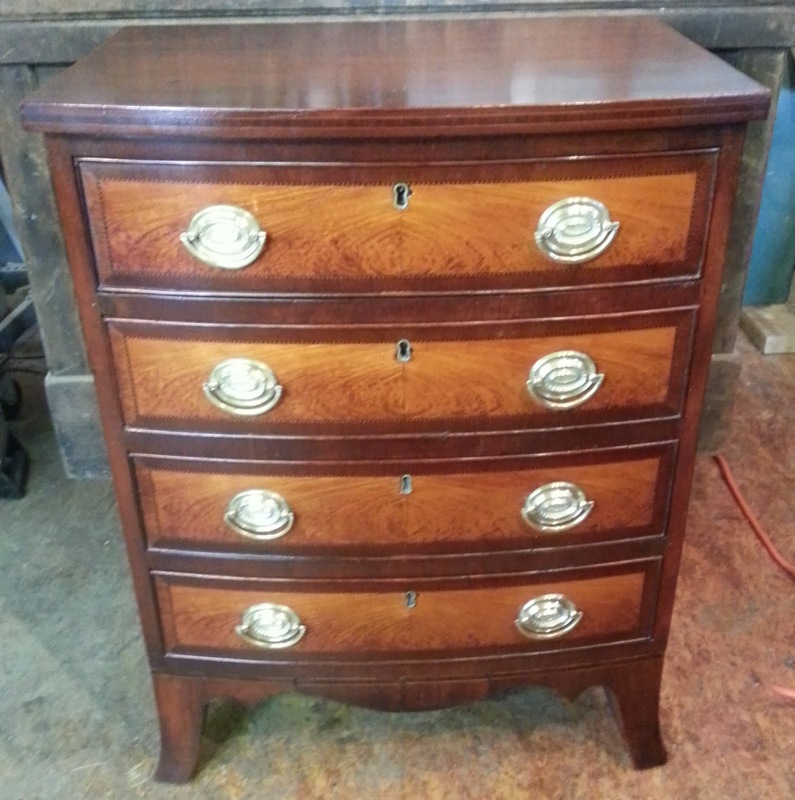 A bachelor's chest is a primarily English form of chest of drawers that was scaled down in size for easy transport. 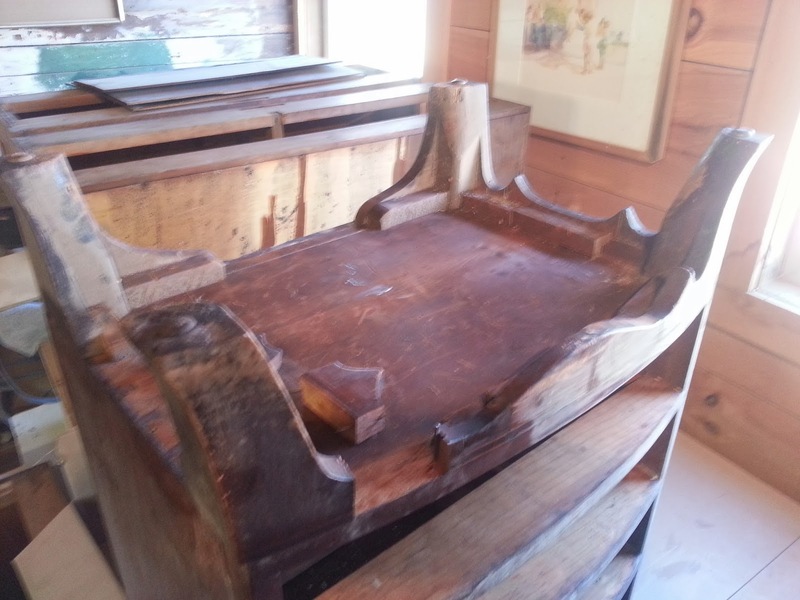 Besides the smaller size of these chest, other characteristics were lifting handles fixed to the sides and either a top that folded out using Knife hinges (much like a game table) which would double as a writing surface or brushing surface, or an actual brushing slide that would pull out just above the top drawer. All of that being said, not all examples had all of these features and in modern times bachelor's chest has become a catch all term for diminutive chests. 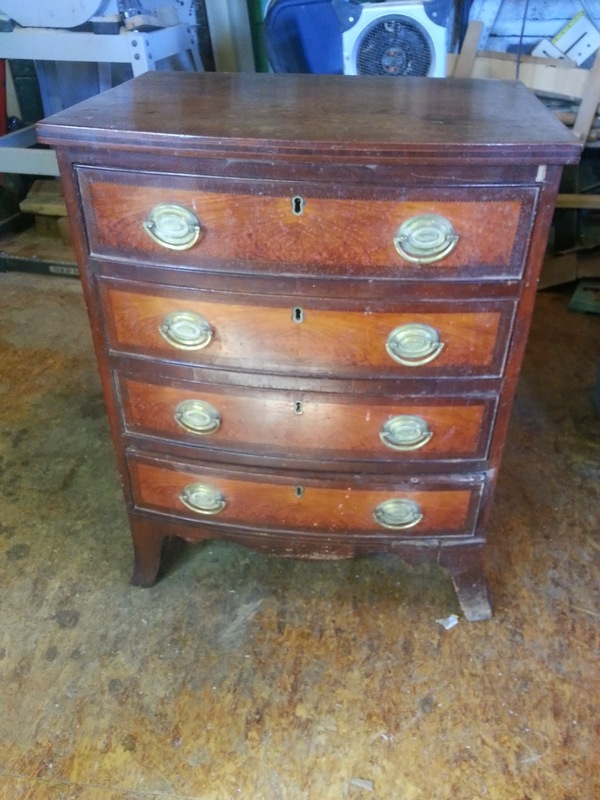 One thing that is for certain is that this is an American chest that was probably made in Upper Massachusetts or New Hampshire in the early part of the 19th century. 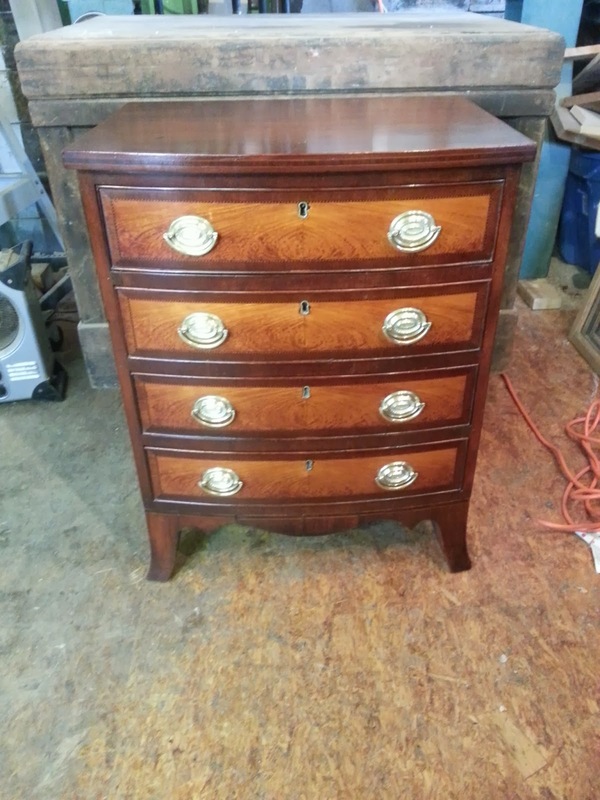 The chest is made primarily of Mahogany and the drawer fronts are veneered with bookmatched panels of figured satinwood. The bookmatched veneer is framed with banding of alternating light and ebonised woods, probably holly. 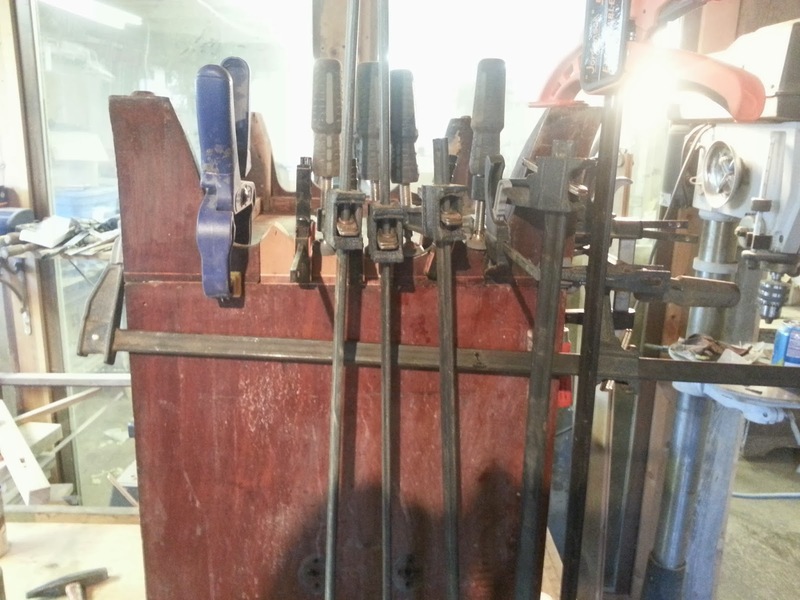 The top edge and skirt are banded with vertically oriented rosewood framed with holly. 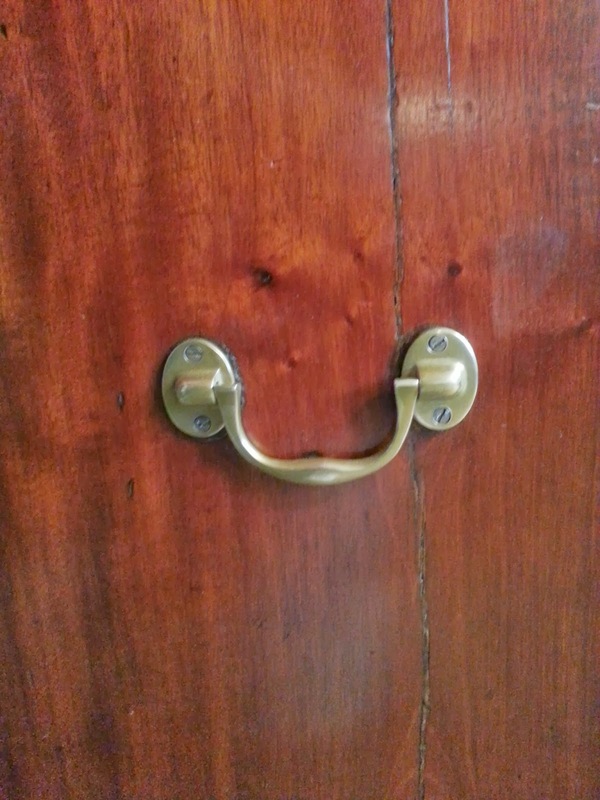 The sides had an incomplete set of lifting handles which appeared to be original and the brass pulls, while looking quite authentic, were replaced at some point. 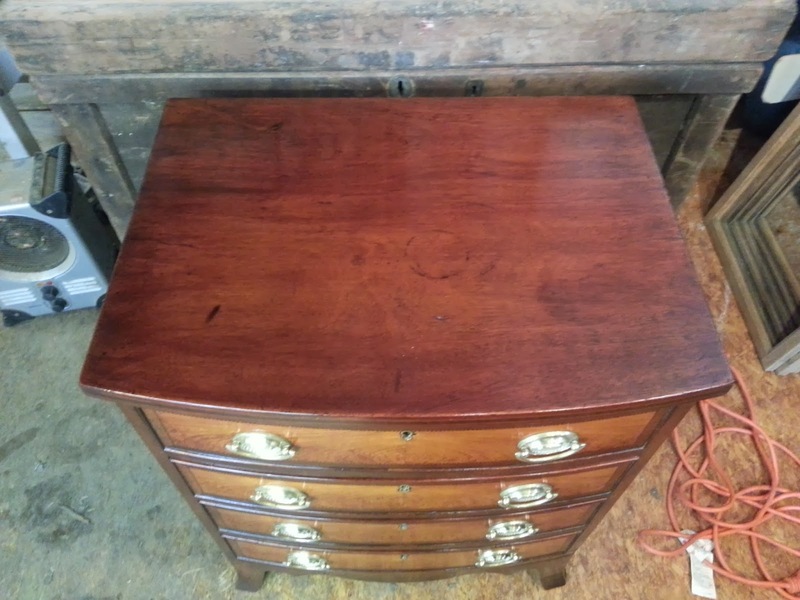 As seen in some pieces, all of the drawers had inlaid brass escutcheons but only the top two drawers were equipped with locks. The locks appeared to be original to the piece. 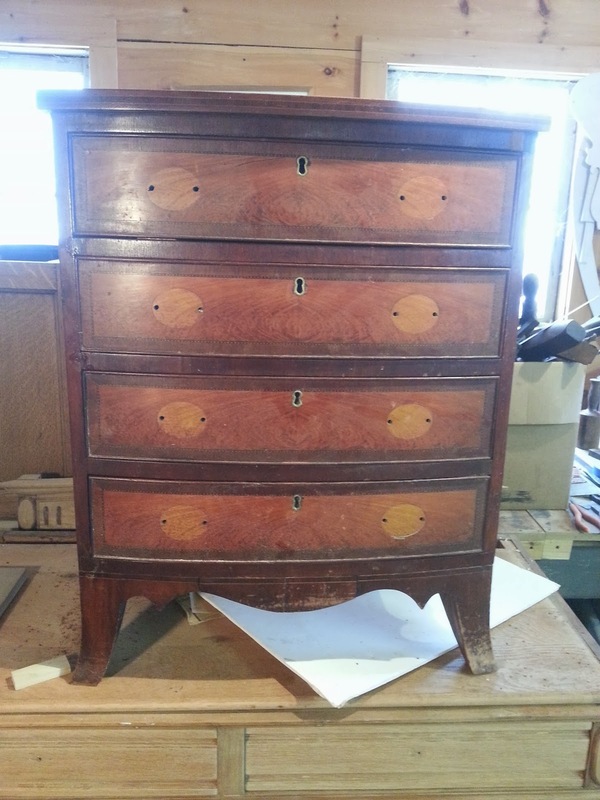 Below is a photo of the chest as it was when it came to the shop. The top surface showed some significant water damage to the finish as well as bleaching form UV light. The sides, besides being very dirty, were cracked. 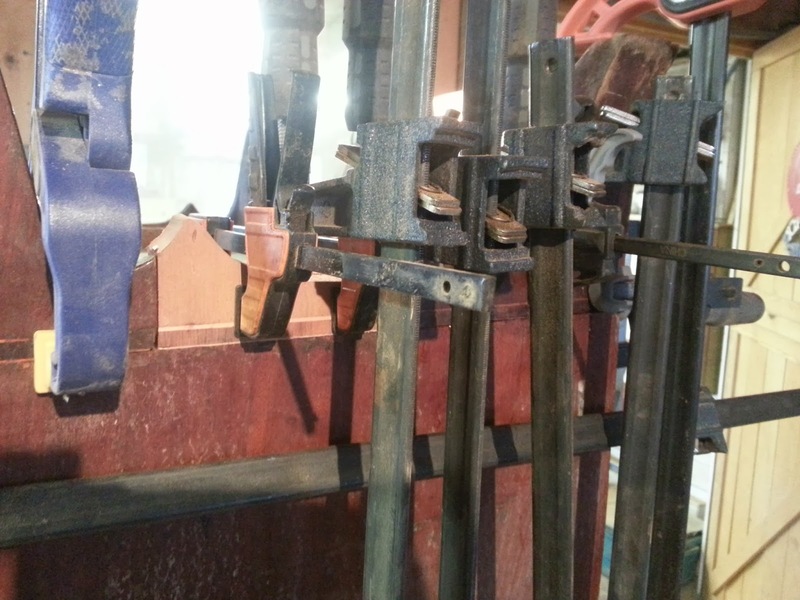 Also in this photo is one of the mounting plates for a lifting handle. The other plate and the handle were missing from this side. 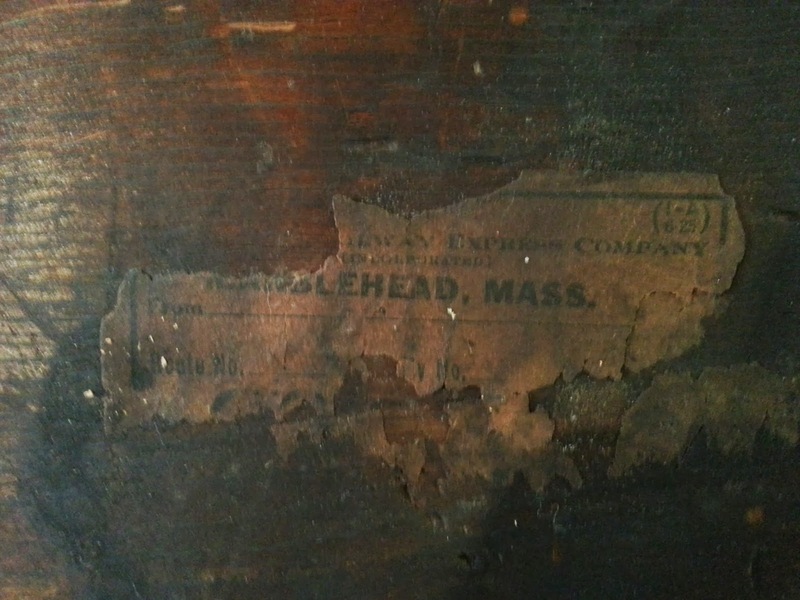 On the back side of the chest were remnants of a moving label from Marblehead, Massachusetts, a sea town north east of Boston. 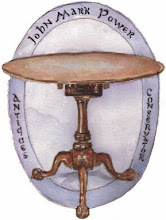 Judging by similar dated moving labels, I would date this label to be from late 19th / early 20th century. One curiosity about this chest was that it appears to have been altered at some point. 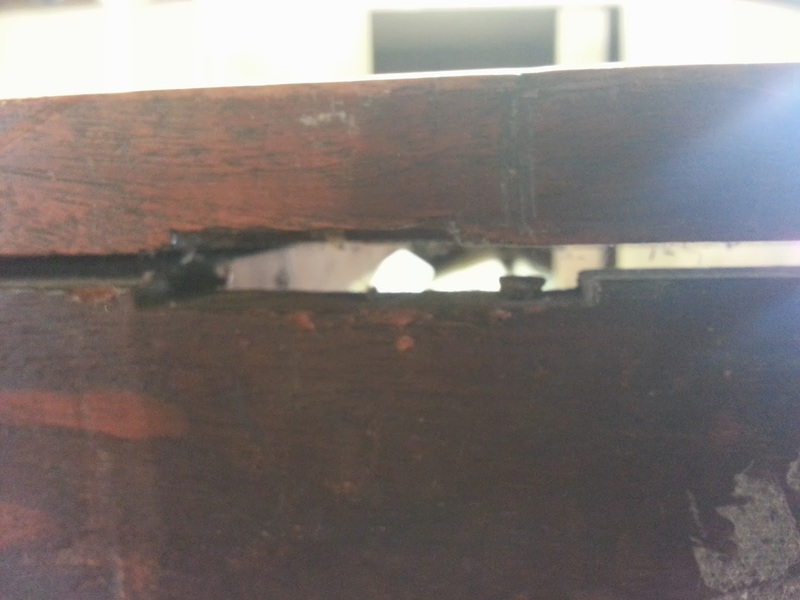 Below the top on the inside of the chest was evidence of old glue blocks which had failed. The "shadow" of these blocks is visible in the photo below. What was curious about these shadows were that they were located about one and half inches below the inner surface of the top. In addition, there was a consistent line that was visible about halfway between the inner surface and the bottom edge of the shadow. It appeared to be an outline of another surface that the blocks were attached to that was below the original top. This can vaguely be seen in the photo below. On the sides the top was attached to the case by use of battens running from front to back which were screwed to the top and sides. These battens, seen below, are modern replacements. 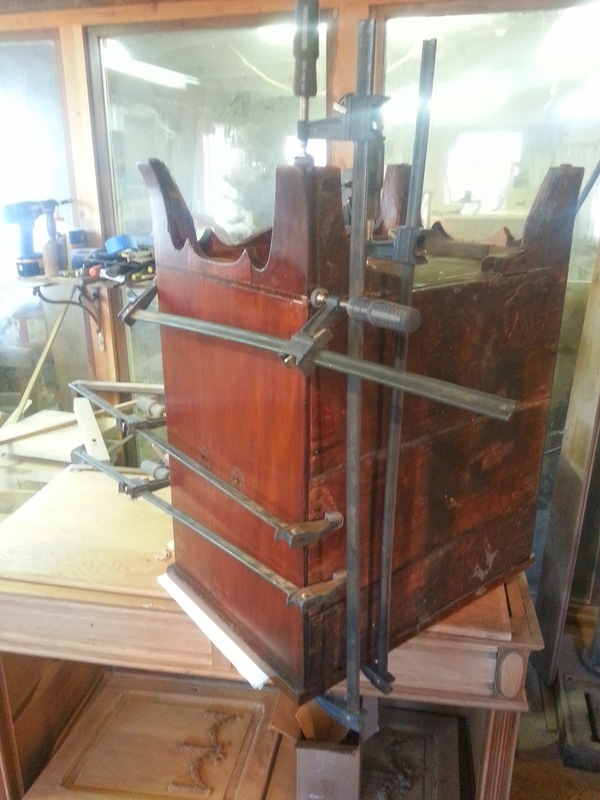 Another interesting feature was the remnants of hinge mortises on the upper edge of the back panel and the lower edge of the back side of the top. 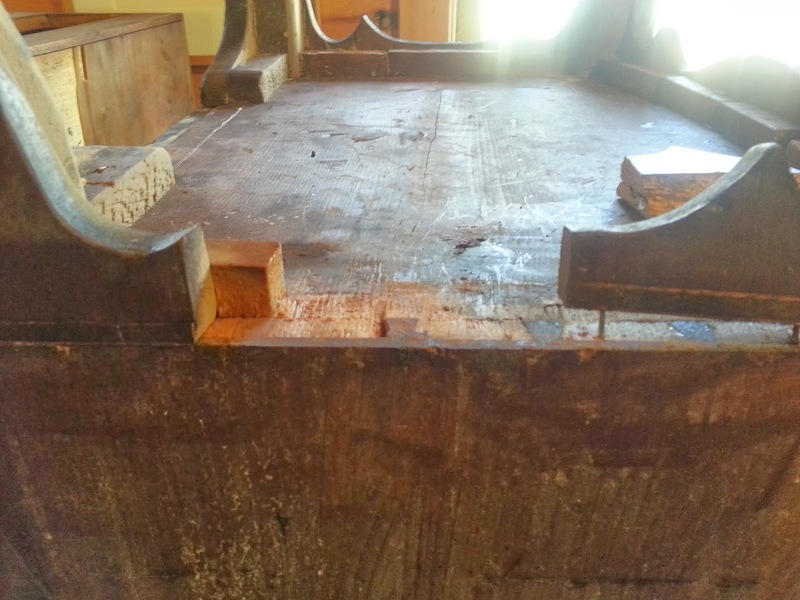 These mortises suggested that the top was once hinged to the back and the shadows of the glue blocks mentioned above seemed to point towards an inner surface that was revealed when the top was lifted. 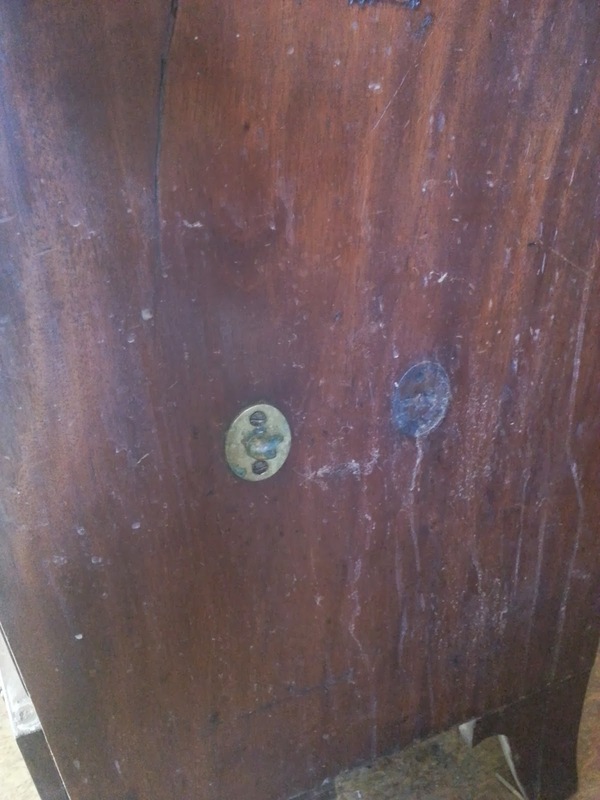 Every board that I examined appeared to be original to the piece and the only really confusing part was that the hinge mortise on the top surface were a different size then those on the bottom surface. 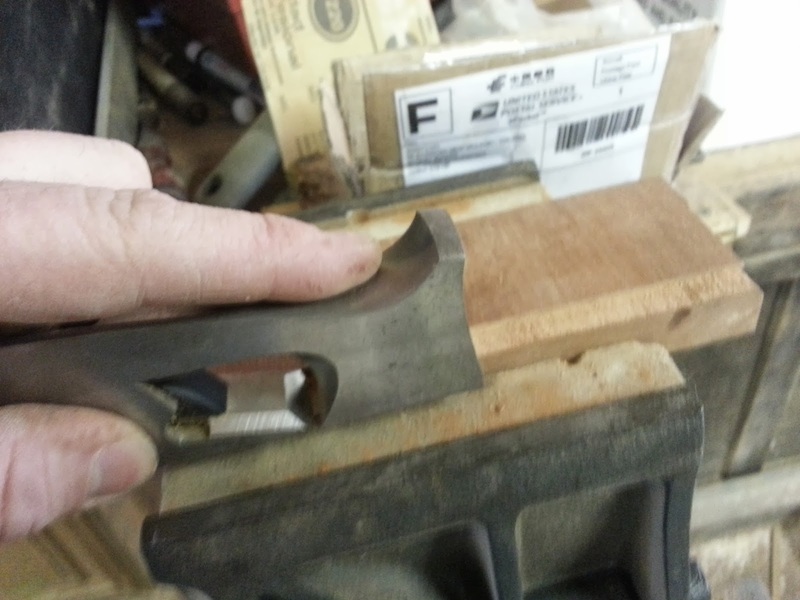 This would indicate two separate sets of hinges. 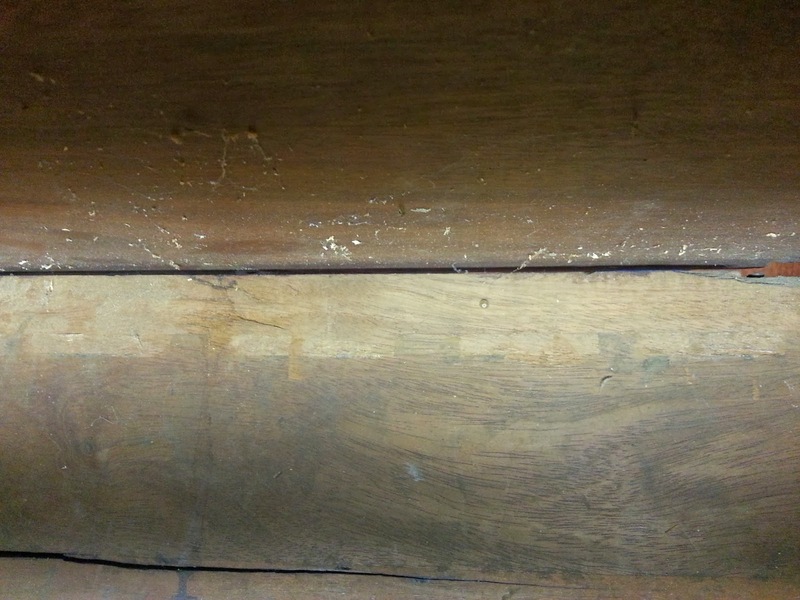 The mortises can be seen below. It is quite possible that this piece originally had a lifting top, but the evidence is inconclusive. 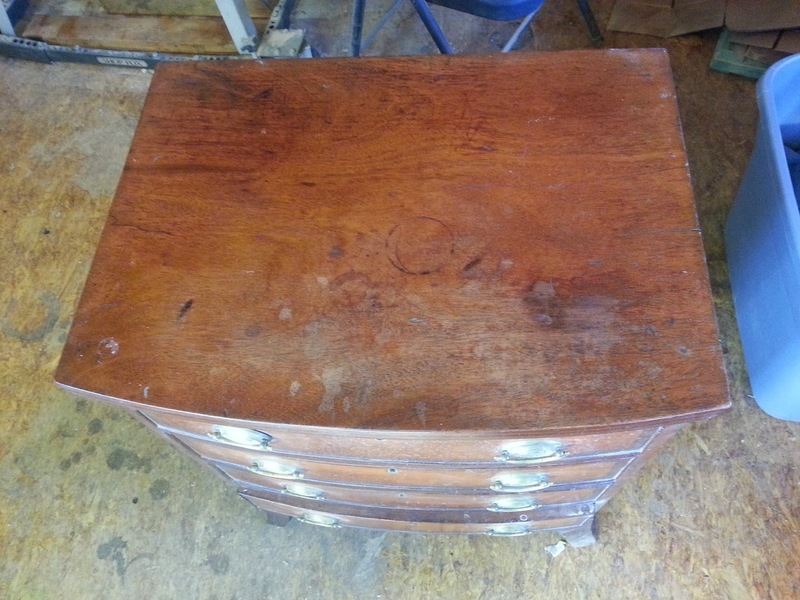 It seems that all of the pieces were original and that no piece was re-purposed from another older piece of furniture. Perhaps another example will surface in the future that will shed some light on this. 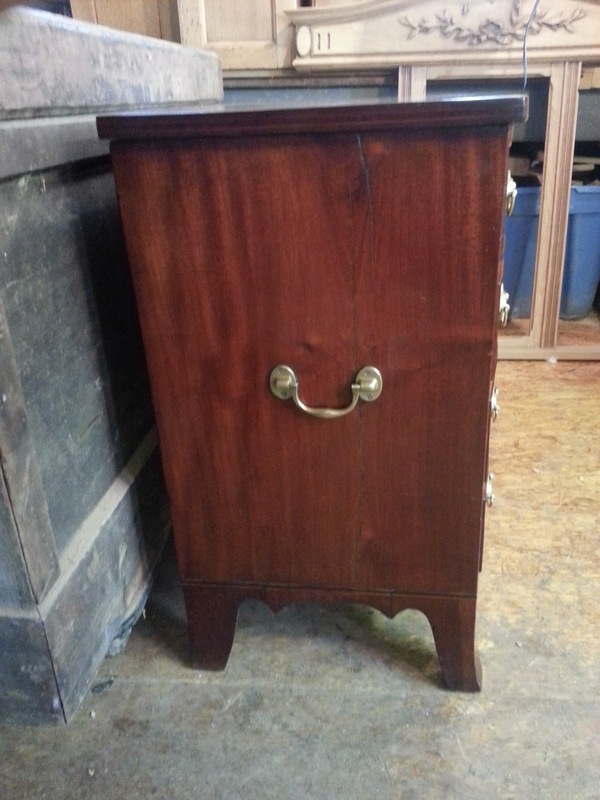 The skirt of the chest was made of mahogany with an inlayed band of vertically oriented rosewood that was framed by holly. 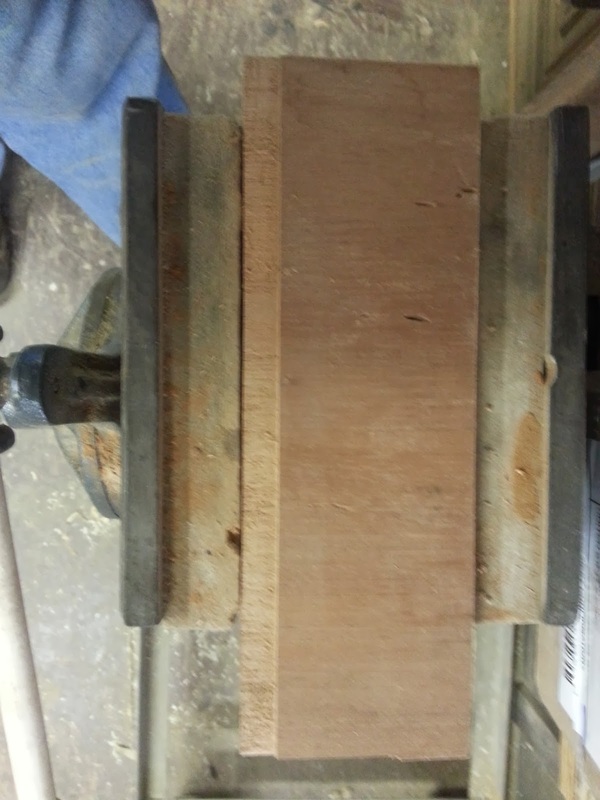 The skirt was not integral to the sides, but was applied with the grain running vertically, like the sides. 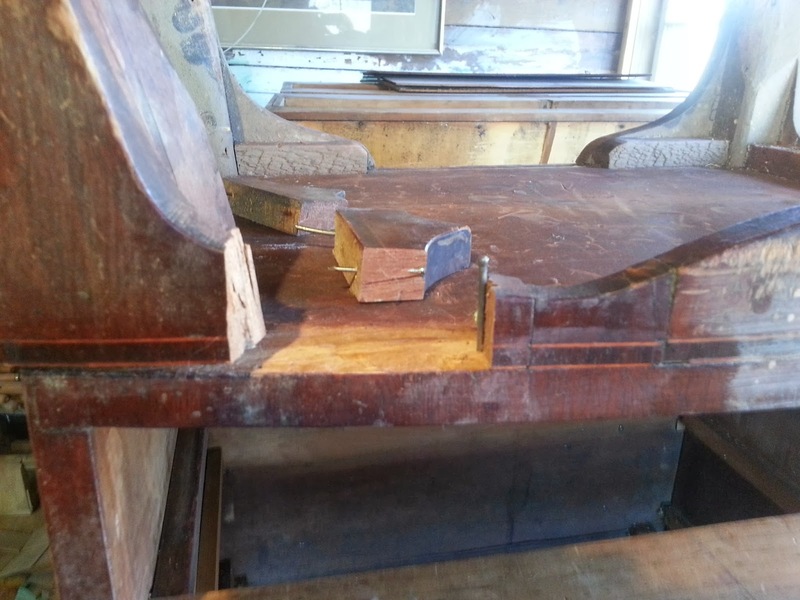 Over time the skirt had broken into sections and had loosened up. Past repair showed that it was nailed back in place, which in the long term was not very effective. As a result, much of the skirt was loose and a large portion was missing and had to be recreated. 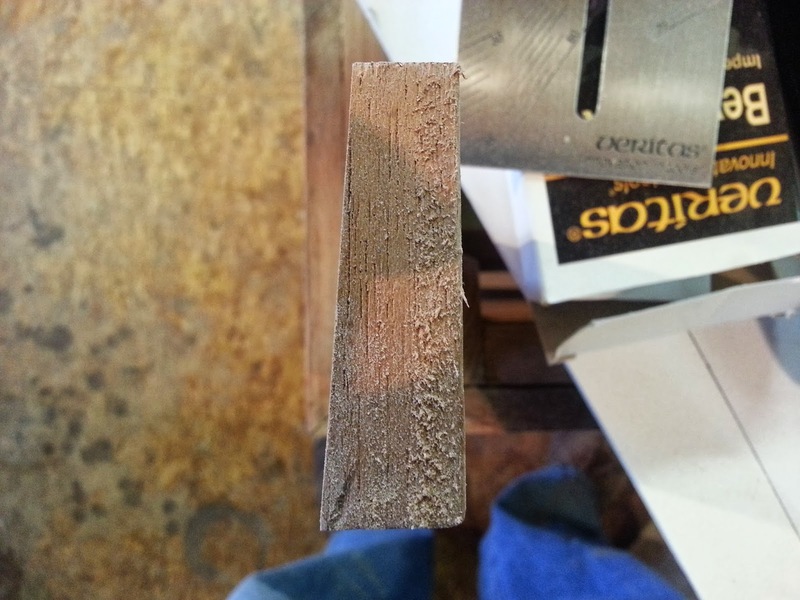 Below is a photo of a section of the skirting followed by a close up of the banding. These next photos show the underside of the case. 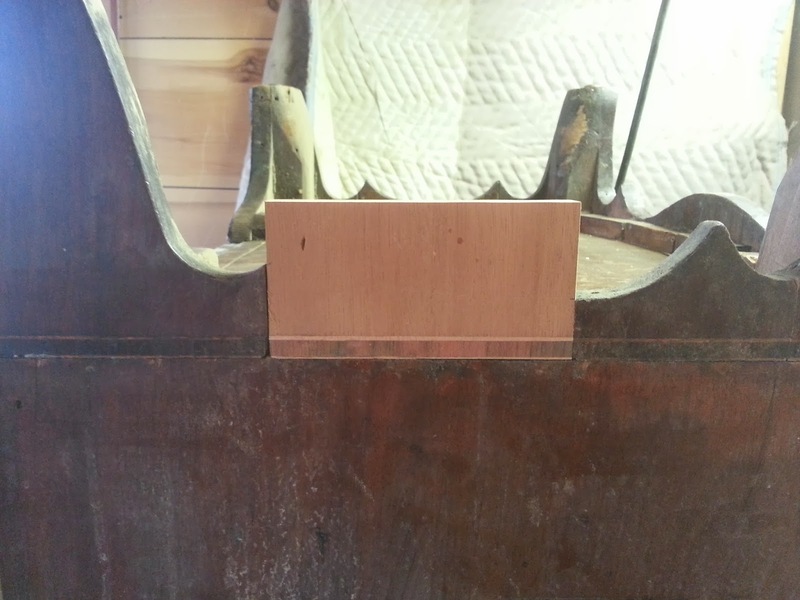 A section of the loose skirting is seen laid on its side on the bottom of the piece. 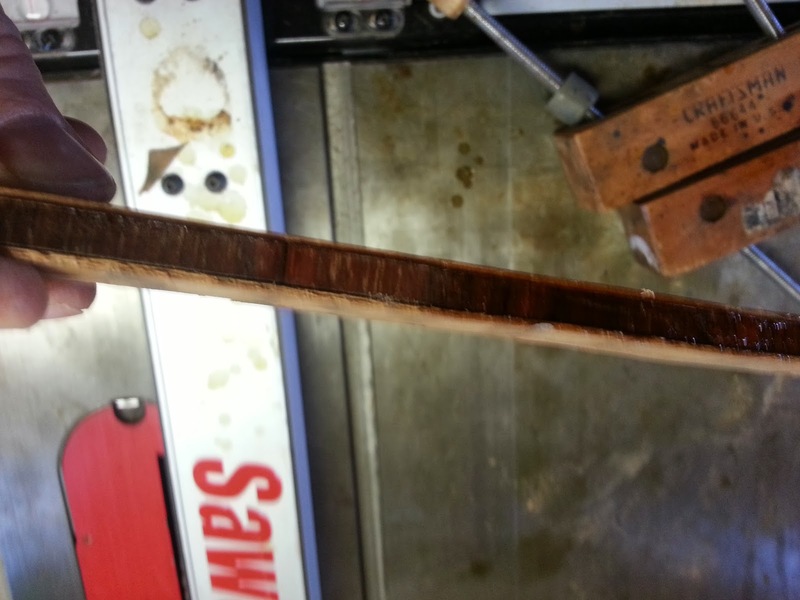 To recreate the missing portion of the skirting I needed to make some of the rosewood banding. Many years ago I went to the recycling center in Lovettsville, Virginia to dispose of my cans and bottles. when I got there I saw a wooden frame leaning up against the metal recycling containers. 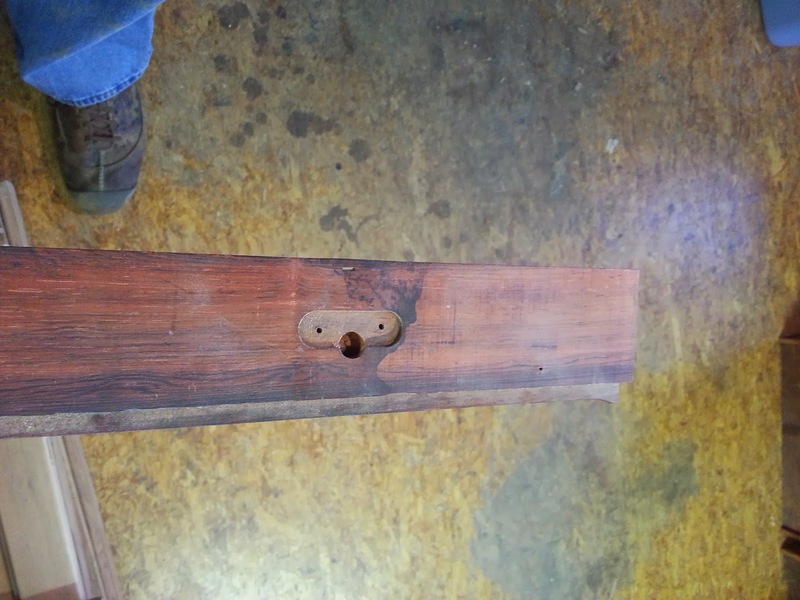 The entire frame was made from solid rosewood. I brought the frame home and over the years I have used this wood for various patches on furniture. I used a small section to make the inlayed banding for this chest. The board used can be seen below. 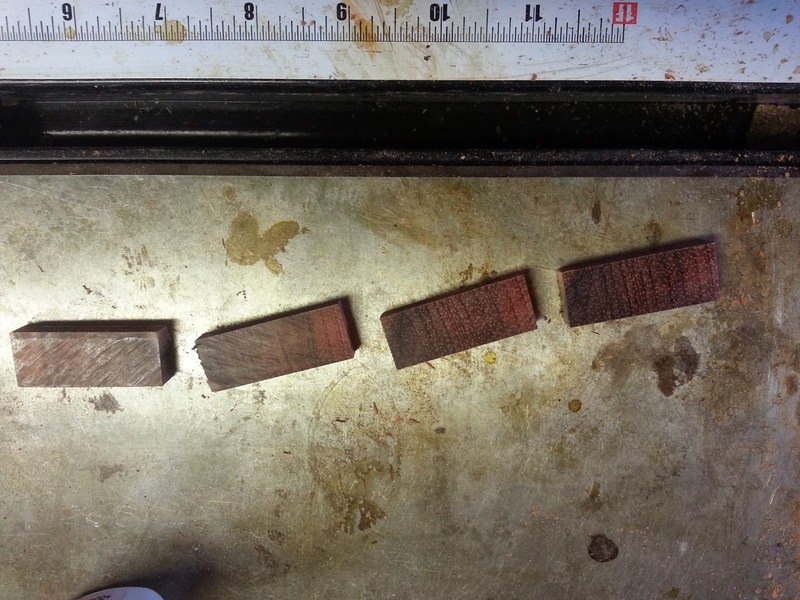 I first cut four section of the rosewood with the grain running up and down, as seen in the photo below. 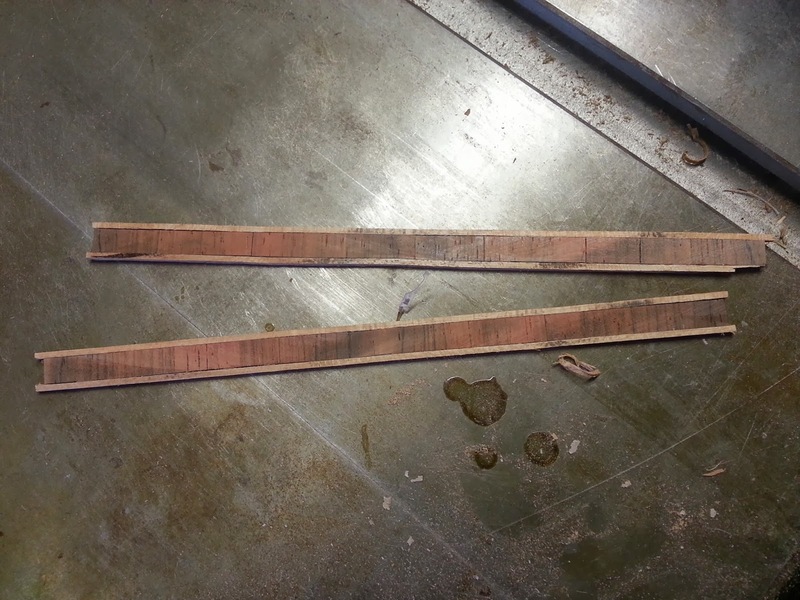 The next step was to glue these together to make a long strip, as seen in the next photo. 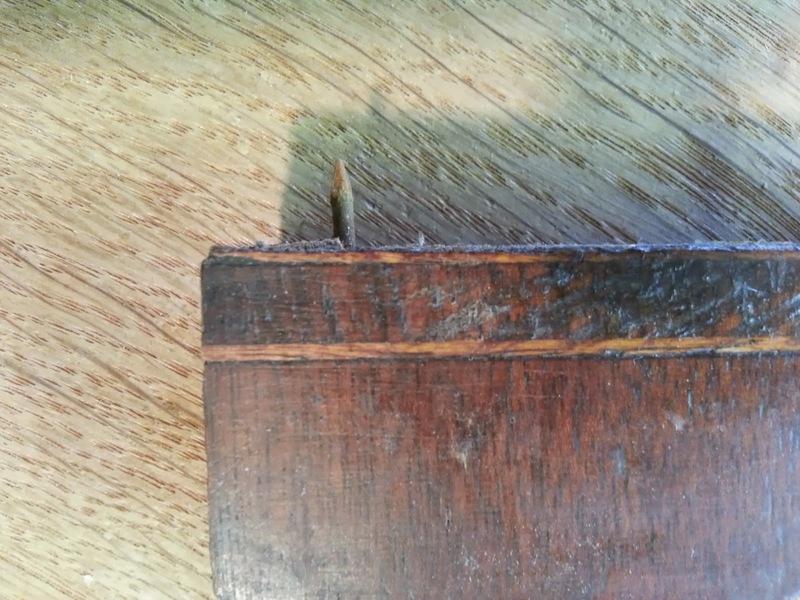 Once the glue had dried, holly veneer was glued onto the outside edges of the rosewood strip. 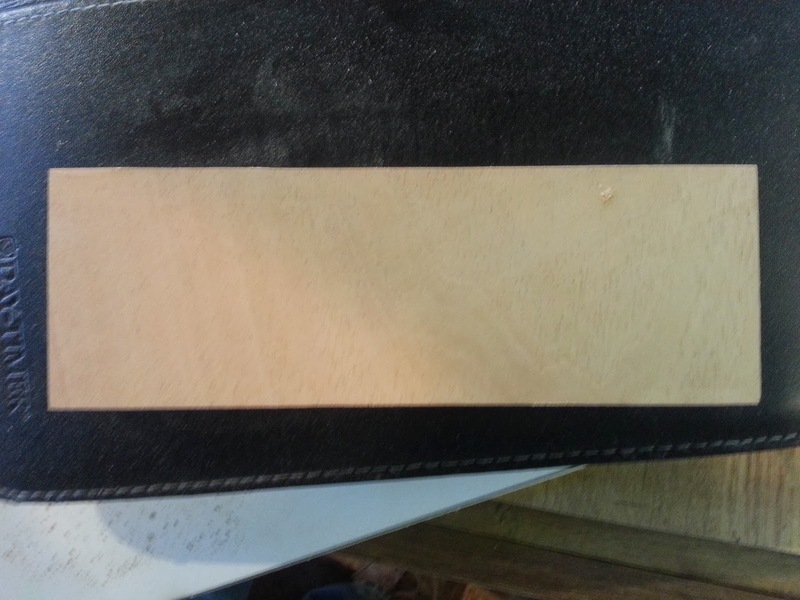 Once all of the glue had dried, I cut thin strips of banding on the table saw from the blank I had made. The finished product is seen below. 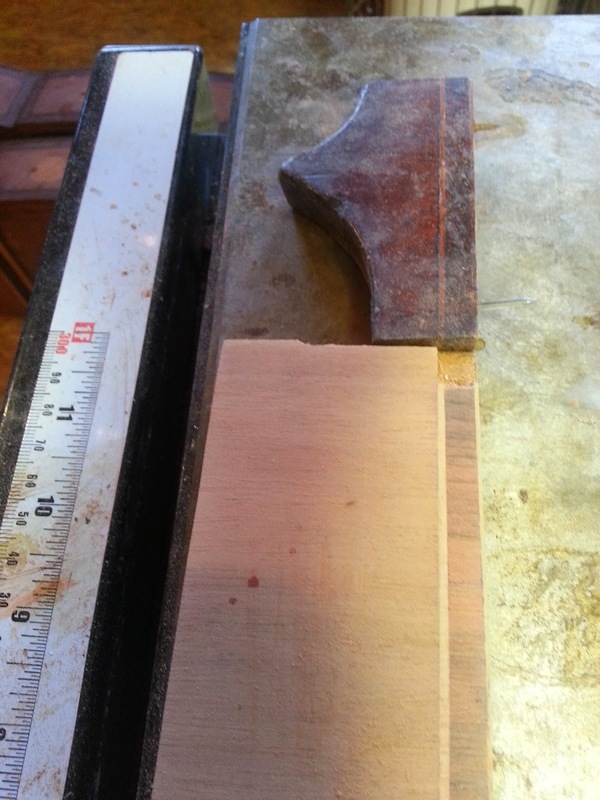 When making the missing portion of the mahogany skirting, I noticed that the inside face of the skirting was not perpendicular to the bottom, but raked at about a 5 degree angle. 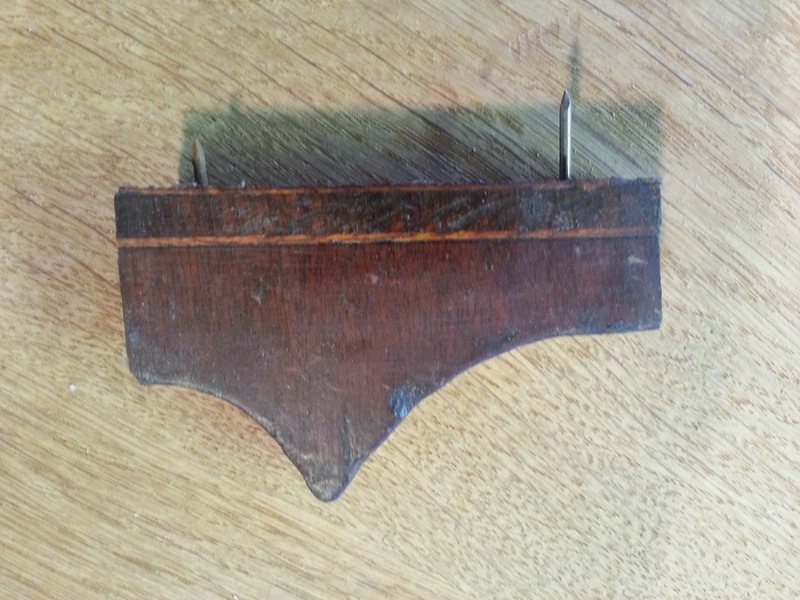 What purpose this served is beyond me, but being faithful to the original maker, I cut my skirt with the same profile. This can be seen in the photo below. You are looking at the edge of the skirting. 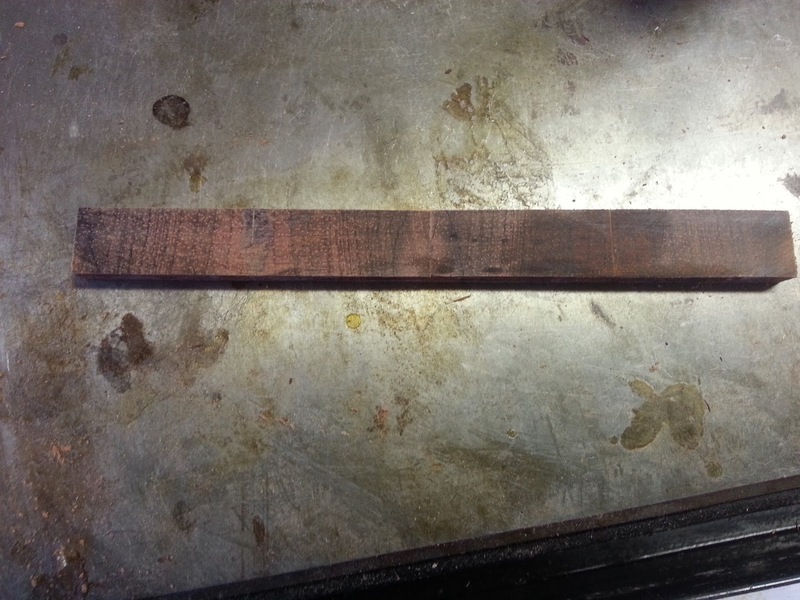 The same mahogany blank seen above is seen here with the face used for the outside edge facing the camera. 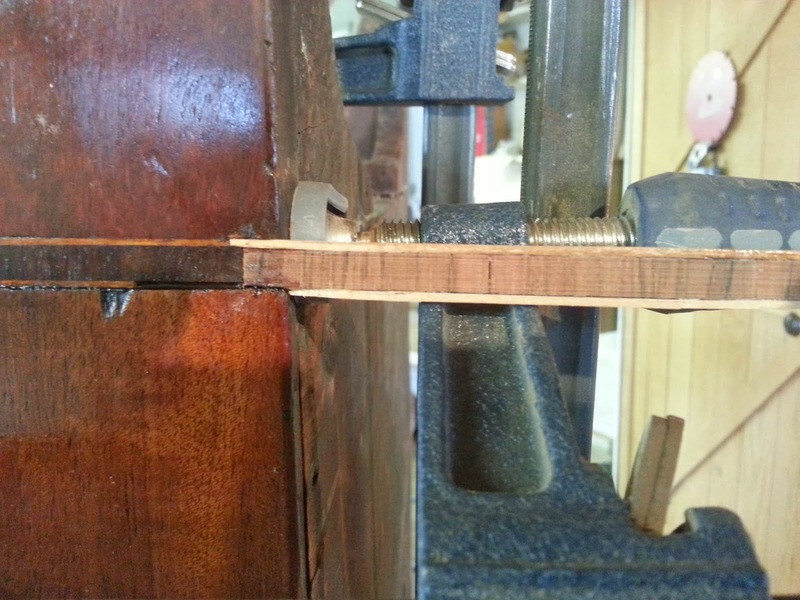 Using a rabbit plane, I created a groove along the edge of the blank for the banding to seat in. 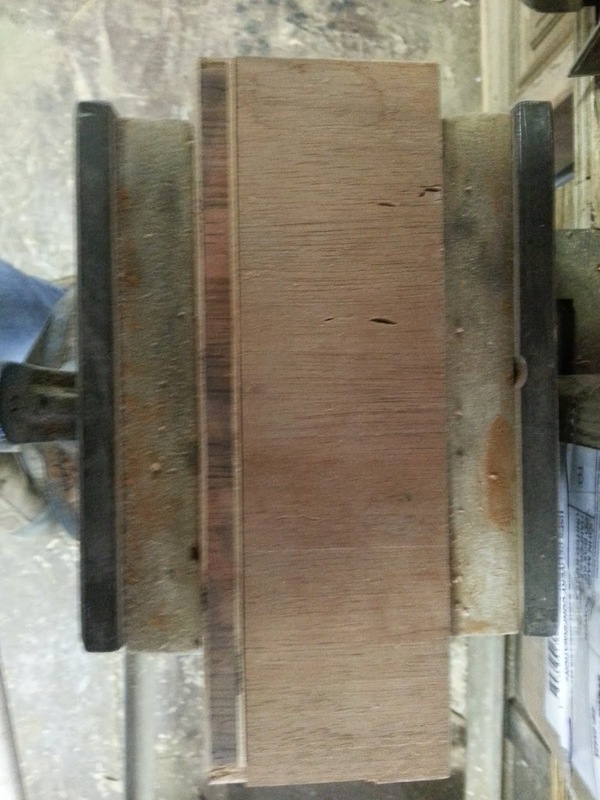 The next two photos show the groove without and then with the banding in place. This photo shows the new apron bank next to an old piece of the skirt. Once the banding was glued in place, I fit the blank into the space for the missing skirting as seen below. I next traced the profile for the skirt from the other side and cut away the excess so the blank fit the profile of the missing skirt. 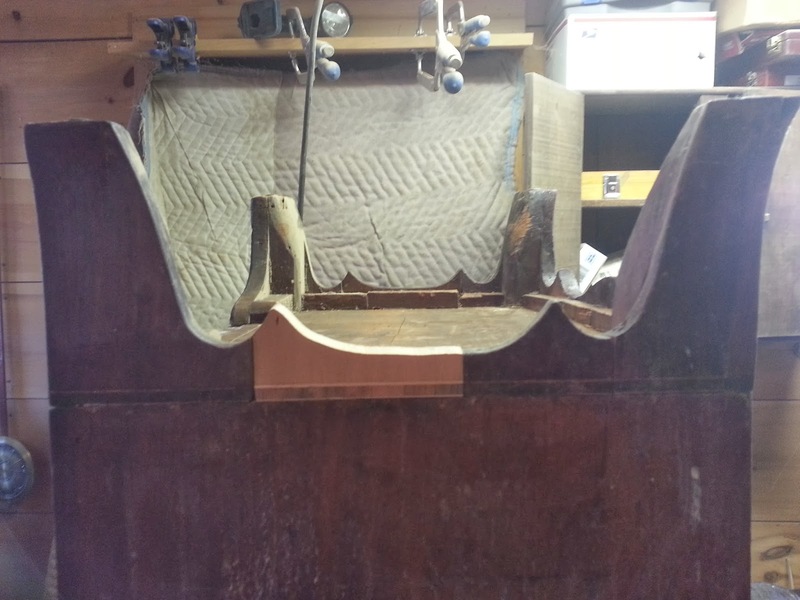 These next few photos show the skirt and the new section of the skirt being glued in place. Test fitting a bit of the banding to an area where a tiny bit was missing. More gluing of the feet and the skirting. 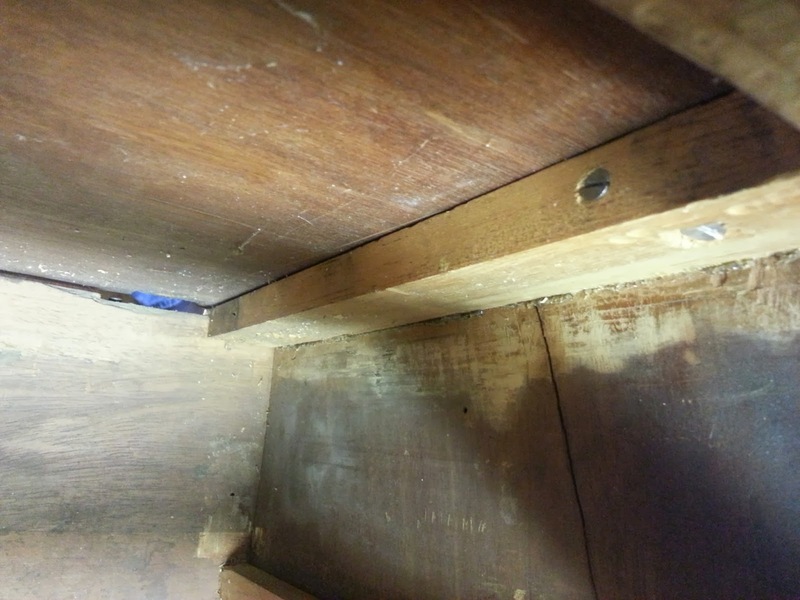 This photo shows the new drawer stops being glued in place. 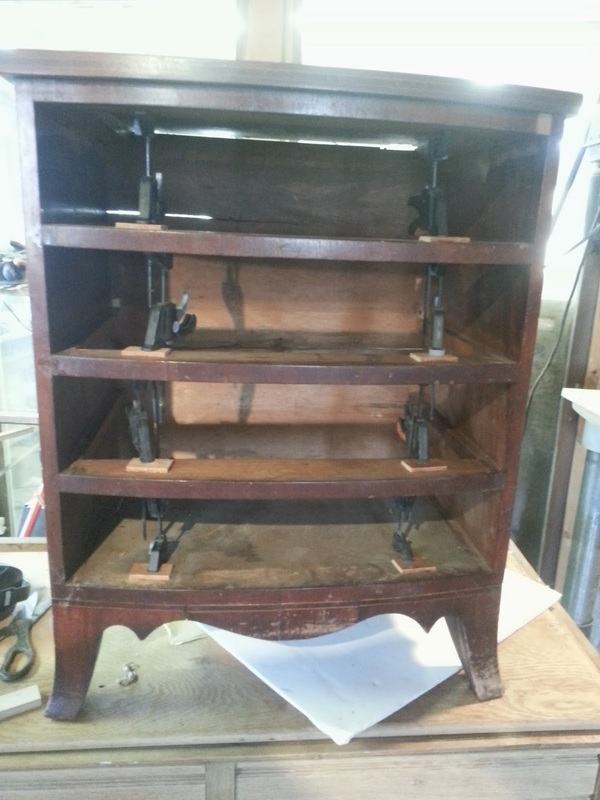 The next photo shows the drawers fit in place. Notice how the shadow of the drawer pulls are lighter where the pulls covered the wood. This is because satinwood oxidizes darker when exposed to sunlight, while woods like Mahogany will lighten when exposed to the sun. 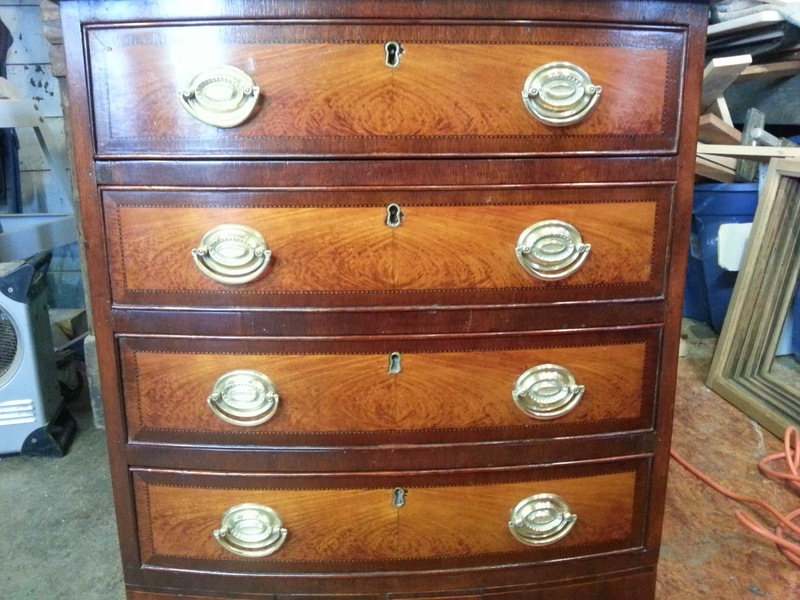 The finished chest with a restored finish and cleaned hardware. 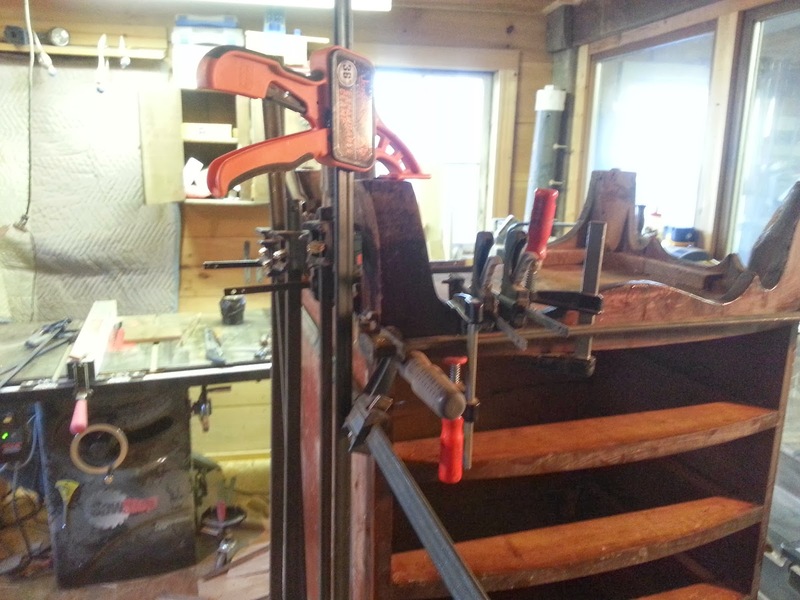 The new lifting pulls were supplied by Londonderry brasses in Pennsylvania. They fit great! A final photo showing the beautiful grain on the drawer fronts.